Helping Low-Income Seniors Build A Social Web Online : All Tech Considered More older Americans are going online, but many seniors don't have the resources, devices or skills to navigate the Web. One pilot program is giving tablets and training to seniors to help them combat isolation while staying safe online. 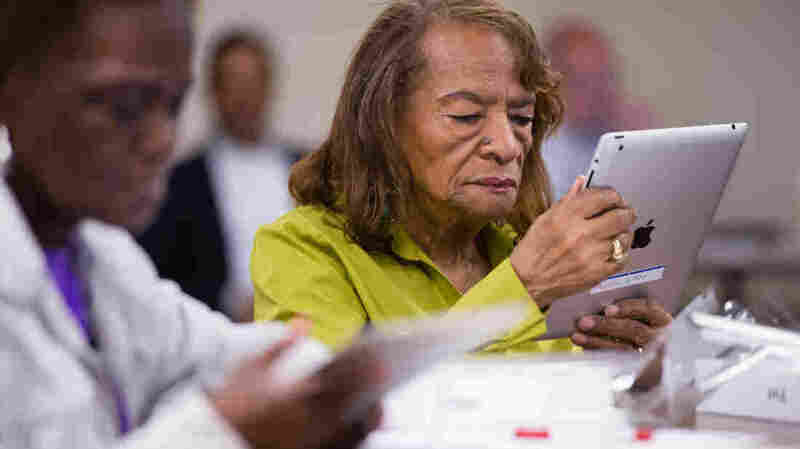 Hazel Avery, 86, holds her iPad for the first time. The Connecting to Community program, with funding from the AARP Foundation, teaches low-income seniors how to increase social engagement online. 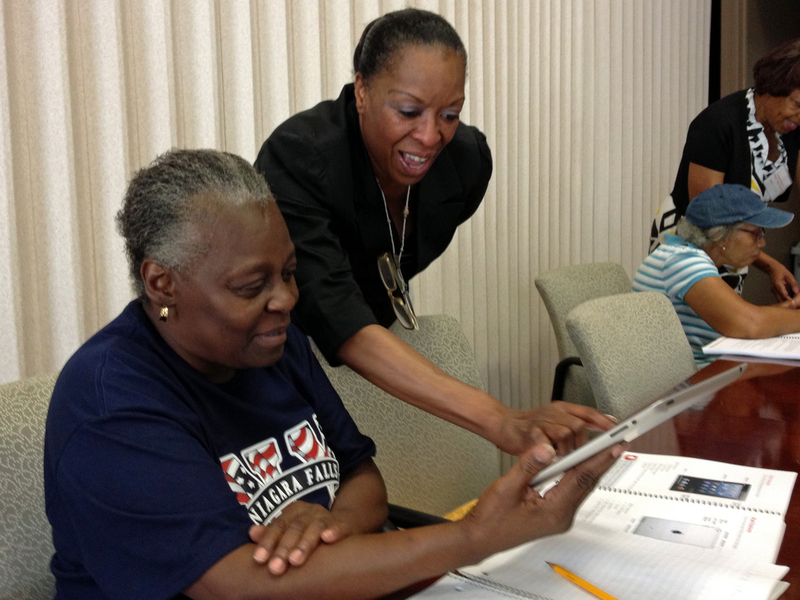 The Washington, D.C., program chose seniors with no previous computer experience. The Internet is often considered the realm of the young. But in the U.S., people over 65 are one of the fastest-growing groups to go online, and social media usage among seniors has soared. A program in Washington, D.C., is designed to bring more seniors online, especially those who are socially isolated. The Connecting to Community training program is sponsored by the AARP Foundation in partnership with the nonprofit Older Adults Technology Services, Comcast and the D.C. social services organization Family Matters of Greater Washington. It puts the latest digital tools in the hands of low-income, older Americans to help them combat loneliness and develop social connections through social media and other online offerings. The program's pilot run just finished in Washington, D.C., and while the free iPad tablets the students received were brand new, some of the people using them were born decades before Bill Gates or Steve Jobs were out of diapers. Volunteer trainer Karen Coville and student Ruby Lester work with Ruby's new iPad. The students, all on limited incomes, have been attending class a couple of times each week, with instruction from volunteer trainers. They've learned to use touch screens and to navigate social media like Facebook and Twitter. But what comes naturally to a 20-year-old can take time for someone three times that age. "I was trying to take a picture, and I ended up taking a picture of myself," says student Doris Bagley at a recent class. "I want to know how the heck that happened." Ruby Lester gets nervous when she sees unexpected pop-ups on the screen. "That scares me, and I just cut my computer off," she says. And Kenneth Butler has had a difficult time using his tablet's camera function. "I have, essentially, tremors," he says. "When I take pictures, I [shake] so much that I don't get a clear picture." The classes are designed to help the participants sort through those issues. Another important component of the Connecting to Community program, explains instructor Sheila Poole, is privacy. "When we talk about your privacy and your settings on the social media, you need to know how to decide what you want people to be able to see, what you don't want people to be able to see, what you possibly don't even want to put on," Poole tells the class. With this group, the touch-screen technology has come easier than learning the dos and don'ts of social networking, Poole says. "We show them ... what your settings should be like for privacy," she says. "[We] teach them how to spot spam items and [that] if you feel uncomfortable about doing something, don't do it. We let them know these are your brakes, just like in your car." But soon these novices to the digital world are cruising down the information highway — some at top speed. James Reese, 69, is a poster child for the pilot program. He's using his iPad to find some old friends — even childhood sweethearts. He's listening to online versions of his favorite blues performers and joining discussion groups about his glaucoma. "I even twit now — I'm on Twitter," Reese says and laughs. The tools he's learned to use here, he says, fill "a lot of void that was in my life, you know, that I used to do when I was young." "Let me tell you, I would recommend [it] to every senior citizen who can. ... It's a way of life now," he continues. "At my age, at 69, I feel great just knowing that I'm up on technology so I can look at like the young kids now. ... They don't have nothing on me!" "We're not seeing people afraid anymore," Poole says of the students. "The fears are gone." Last Friday, 55 senior Connecting to Community students gathered for a graduation ceremony. Now that the D.C. program is over, the participants are expected to continue to keep in touch with each other — online and in person. "We are seniors, but we never get too old to learn," noted one participant. A similar program for senior citizens in Sioux Falls, S.D., continues until March. The AARP Foundation and Older Adults Technology Services will then evaluate the program to determine if it should be launched elsewhere.